Successor to the magecraft of the Tosaka family and inheritor of their legacy, Rin Tosaka had been taught by her father to prioritize sorcery over personal interests. When her father was killed in the Fourth Holy Grail War, Rin continued to train herself with assistance from a guardian, who also happens to be the supervisor of the Fifth Holy Grail War. Chosen to participate by grandfather clause, Rin was paired with Archer (to her dismay), and the two have teamed up to participate in the Fifth Holy Grail War. In the beginning of the Fate/Stay Night series, Rin and Archer eventually paired up with leading roles Shirou Emiya and his partner Saber, and since then Rin has played the role of a mentor to Shirou, whose ability as a sorcerer is latent, even after she lost Archer as well as the war itself. 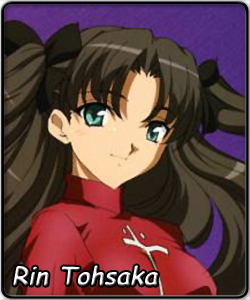 Outside the Holy Grail War, Rin attends the same school as Shirou and works diligently to earn the admiration of her classmates, but in reality, she tends to be tomboyish and procrastinate often. Despite this, she is perceptive within her surroundings, resourceful in her abilities, and avidly competitive against her opponents. Strangely enough, Rin was very much unlike herself during her Saimoe days. Entered into the 2006 Saimoe Circuit, Rin has done amazingly well in the tournaments she has entered, finishing in the top 16 in each. However, unlike Suiseiseki (RM), Shana (SnS), and Yuki Nagato (SHnY), the only other three who do so (in terms of entering more than one event), Rin's road to the Saimoe crown was a quiet route. Although she is avidly competitive, her matches were no more than steady, as she followed impressive win by impressive win before eventually losing quietly. In Korea Best Moe, she defeated Tsuruya (SHnY) by a decent 300 point performance, but she then lost to eventual champion Suiseiseki by only 51 in the quarterfinals. In Saimoe Japan, she kept the same pace, defeating one opponent after another by a face value of 100 points each, including a 75 point win over Yurie Hitotsubashi. However, the Round of 8 proved fatal once again, as she steadily paced her competitive self into a loss to Chikaru Minamoto by 172. After a year long break and a study abroad session in London, Rin was invited to take part in Korea's Super Best Moe event, where she created a short rivalry with Nagi Sanzenin (HnG), first leading her group with a 57 point lead over Nagi, and then eventually losing in a one vs. one rematch by 137 points within the knockout rounds. With the Fate/Stay Night series completed with much success, Rin will be focusing much of 2008's Saimoe Circuit studying in London to become a true magus through the wishes of her father. However, upon entering the International Saimoe League, this will be the first time Rin will be truly tested against the toughest competition assembled. Even so, Rin will bring her competitive nature combined with perception and resource and try to win her own Saimoe crown.